Most of us could not imagine our lives without Smartphone, but the most annoying part of Smartphone remains its battery life. No matter how power efficient our device would be, the smart display, faster performance and several apps running on our phones end up consuming all of it. Now, I am here just not to talk about all these problems that you are facing, but I am here to introduce you an ultra-fast-charging battery that can charge your Smartphone in as little as 60 Seconds. Yes, you heard right! 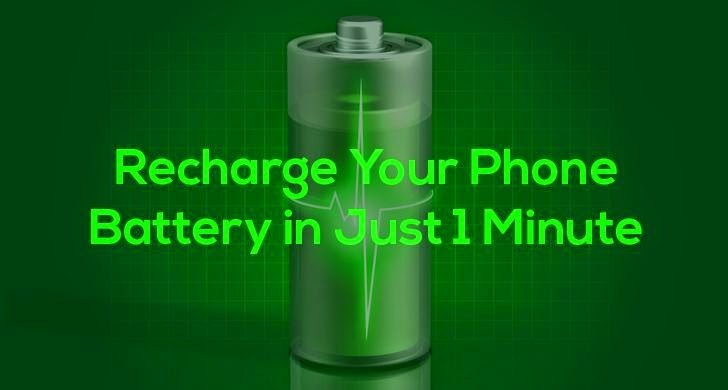 Recharge your battery in just 60 seconds means, 1 minute. Scientists at Stanford University in the U.S. have developed a prototype aluminium battery that charges smartphone to full capacity in just 60 seconds. Researchers say that this new aluminium battery is long-lasting, flexible and cheap, and could one day replace lithium-ion and alkaline batteries used in used in millions of mobile phones and laptops today. In addition to recharge phones much faster, the new aluminum-ion battery is also safer than the existing lithium-ion batteries, which likely catch fire, according to researchers. "We have developed a rechargeable aluminum battery that may replace existing storage devices, such as alkaline batteries, which are bad for the environment, and lithium-ion batteries, which occasionally burst into flames," said Hongjie Dai, a lead author and professor of chemistry at Stanford. "Our new battery will not catch fire, even if you drill through it." The new, experimental, aluminium-ion battery made of aluminium and graphite — both are "quite cheap." Aluminum is used to make the negatively charged anode while graphite used as a material for the positively charged cathode. The Graphite cathode and Aluminum anode along with an ionic liquid electrolyte cased in a flexible polymer-coated pouch. The team was able to generate around 2 volts of electricity, which is higher than the previous experiment with aluminium. In a video demonstration (below), scientists were able to show how a couple of their prototype aluminum batteries are used to charge a smartphone "within a minute." Now, a question just strikes in my mind. If aluminium-based batteries are so much fast and safe to use, then why didn't battery manufacturers use aluminium from the beginning? The aluminium-based batteries were tested in past as well. However, previous experiment with aluminium batteries lasted just 100 charge cycles while the Stanford aluminium-ion battery can withstand more than 7,500 charge cycles without any loss of capacity. When compare with a typical lithium-ion battery that lasts around 1,000 recharge cycles, the aluminium cells are long-lasting. "The grid needs a battery with a long cycle life that can rapidly store and release energy," said Dai. "Our latest unpublished data suggest that an aluminum battery can be recharged tens of thousands of times. It is hard to imagine building a huge lithium-ion battery for grid storage." In short, aluminium-ion batteries could be a sort of Holy Grail for mobile devices in future that not only charge faster, but also have flexible form factors. For now, scientists are still working to improve the voltage capacity of the new aluminium-ion battery because at the current, it only produces about half the voltage of a typical lithium-ion battery.